Hey, hey everyone. Off to a late start today because we found the previously mentioned cat under the house and it took most of the morning to lure the thing back into our loving arms. Apparently, he'd gotten in a rumble with the neighbor's male and was shivering to come out. Poor dear. 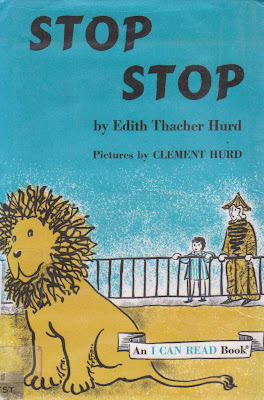 So, without further yack yack, today's Great Monday Give is an excellent, ex-library copy of Stop Stop by Clement and Edith Hurd. All you have to do to be entered to win is leave a comment right here on this very post before midnight ~ Sunday ~ March 1st. (Ack, is it March already!?!) I will pick a winner at random and announce the following day. So, now to the winner of last week's give, Pardon My French... a new reader who came to us via the very cool Book-A-Rama. The Funny Thing is yours and all you have to do is send me your info to webe(at)soon(dot)com. I love the idea of your blog! And your Etsy store...amazing! Looks like a great giveaway book. Thanks! This looks like a great one for my daughter who's just starting to read. I have a different book by the same illustrator but not sure about author. Johnny Lion's Book, I think it's called. Oh, we would love this book! And glad your cat is back home safe. LOve your books and giveaways...hopefully lucky #10 will win. this looks like a great book for my lion-loving little one. thanks for the giveaway! Oh, wow, I won! I can't believe it! This week gets better and better. Thank you so much - I'll e-mail my info to you tonight. So glad I found your blog (and Etsy store). Perfect book for the little Leo in our house...funny how he's too y oung to get the concept of his Zodiac sign but loves all things LIONS...go figure! Delighted to find your blog, as I'm obsessively searching for my childhood faves, and anything I may have missed 1st time round! If you ship internationally I would love this title for my daughter Elizabeth - if not I can supply a US address. Thank You!